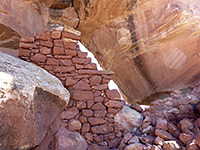 Johns Canyon is a large, branched drainage that defines the west edge of the southernmost part of Cedar Mesa; the east side slopes steeply down to the Valley of the Gods. 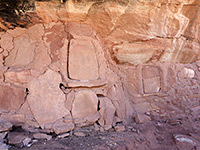 The lower end of the canyon is over 1,500 feet deep, around the confluence with the San Juan River, but the upper reaches are much shallower, and here are found several sets of well preserved Anasazi ruins, built in elongated alcoves along the buff-colored cliffs and benches of Cedar Mesa sandstone, typical of all ravines in this area. Johns Canyon is not well known and is not signed from the highway, though the main track used for access does have a BLM register, and in recent years this area is receiving more use, as shown by a proliferation of illegal ATV tracks along parts of the canyon rim. 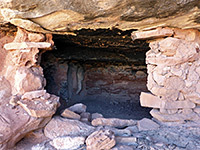 At least five of the short upper forks of the canyon contain ruins, but the main place is in the west fork, which has two significant sites plus a few lesser places, seen on a loop hike of just four miles. 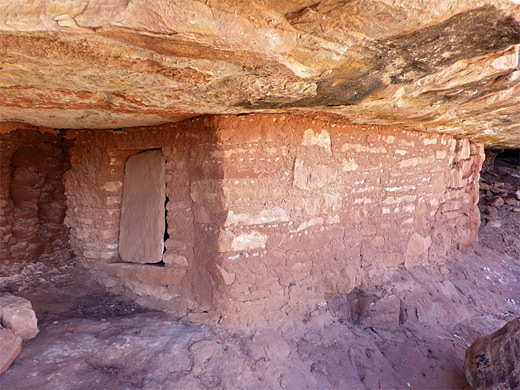 Walking through the canyon is relatively straightforward as it is not particularly steep or overgrown, but the two groups of ruins are high above the floor, close to the mesa rim, and the routes up may not be obvious. 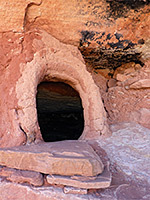 The two sites may be seen in three hours or so, but one or more full days could be spent exploring more of the canyon system. 19 views of the West Fork of Johns Canyon. The east side of Johns Canyon may be reached from a track that leaves Hwy 261 between mileposts 16 and 17 and heads due south, however the preferred access is from the west, along a better quality track starting between mileposts 17 and 18, just as the road curves from east-west to north-south. The junction is unsigned and not obvious, since the end of the track is partly hidden by a patch of gravel. The track immediately descends into a gully, passes the BLM notice/register, and continues over flattish terrain covered in scattered pinyon and juniper pines; the surface is red earth, impassable when wet, but fairly smooth when dry, while the road is narrow and lacks verges. Tree branches protrude on both sides. The road heads southwest, quite straight, past two minor junctions to a third intersection after 1.7 miles; a possible parking place, with space for one or two vehicles. From here an even narrower road runs southeast for 1,200 feet to the first of several ATV tracks (on the west side) that descend slightly through the sparse forest and reach the rim of the west fork of the canyon in another quarter of a mile. Vehicles have been driven all around the head of the drainage hereabouts, creating many criss-crossing pathways. Entry into the West Fork of Johns Canyon is right at its northernmost point, climbing down a few small ledges then walking along quite a well defined path, on the west side, marked by cairns. The ravine soon deepens via a 40 foot dryfall, while the path stays fairly level for a few hundred feet before taking an easy course down to the streambed; the canyon by now is already quite wide, and the creekbed contains alternating patches of bare rock, boulders and sand, lined by thin bands of trees and bushes. If dry, walking is simplest right along the streambed. The first significant tributary joins from the east after one mile, just after which, on the west side, are the first of the two main sets of ruins, about 200 feet up and just visible from below. Prior to this, harder to spot, are a couple of granaries and some petroglyphs. 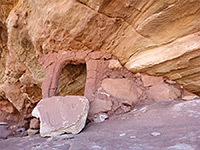 The main site has one ruin on a lower level, still high above the canyon floor, and others on a bench above, guarded by a lengthy cliff around 10 feet high. A log may be left in place to aid climbing up, a little way to the north of the ruins. 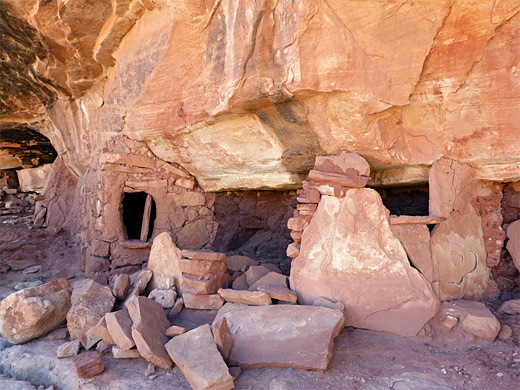 The main (upper) level includes two granaries and two large rooms, and the site has grand views up and down the canyon, extending south across a big pour-off half a mile downstream, and beyond to the point where the west fork joins the wider main branch of the canyon. The second large group of ruins are up the east side tributary, the lower end of which is separated from the main west fork by a narrow ridge, a quarter of a mile long. The only remnant visible from the canyon floor is a wall, right at the southern tip of the divide, between two big boulders; the main site is about 600 feet north, just below the rim, and again around 200 feet up. The best route seems to be directly along the streambed almost to the plateau, then back south along the uppermost bench. 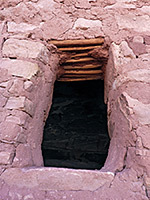 At least ten major structures are found in a shallow, elongated alcove, several with intact, closed, original stone doors. Most rooms are granaries, one beside a sizeable fire-blackened ceiling. Neat woodwork is evident in some of the walls and ceilings, and also a variety of masonry styles; one granary is constructed of very small stones alternating with larger ones. 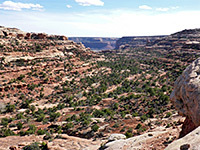 The canyon rim is just above the ruins, and it is easy to walk north along the plateau, arriving back at the junction with the access track in just over a mile.